If you want a female specific lightweight trail shoe that offers good flexibility and protection Merrell may just have the answer. When searching around for new hiking footwear Nat, my wife, wanted something lightweight first and foremost. She’s not a huge fan of the super-heavy, stiff varieties and, to be fair, the vast majority of her walking and hiking doesn’t warrant a genuine mountain boot. Consequently, she either opts for lightweight boots, mid-boots or trail shoes according to the terrain. However, depending on how much walking you actually do, you may only have need for one pair of shoes. What then? Which should you choose? 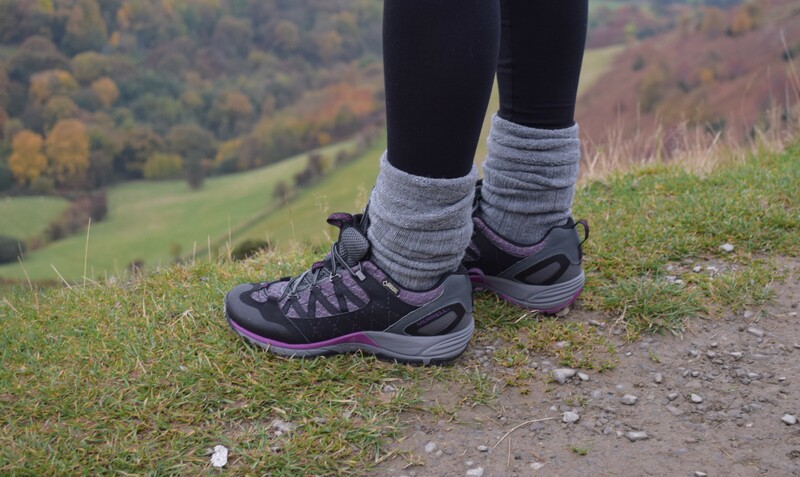 If much of your walking and hiking is over non-technical terrain, such as woodland paths, well maintained waymarked trails or other undulating lowland routes, then trail shoes might be your best option. They offer far more stability and protection than trainers but won’t have you walking like John Wayne in lead boots either. As such, these, the Merrell Avian Light Sport shoes, are well worthy of consideration. Merrell are an established outdoor brand with a lot of knowhow to call upon. 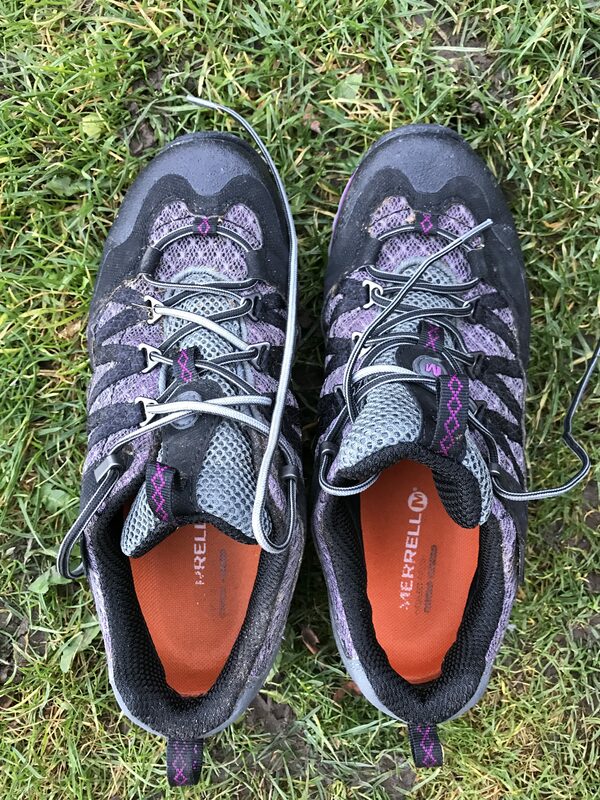 Granted, that’s not always a recipe for success, but a quick scan of Google to read reviews such as this should leave you with the impression that Merrell footwear will be a good investment. With a sale price of just £48 (down from the RRP of £120) these are certainly a good investment. At just 312g these are certainly light; something Nat noticed immediately. The combination of featherweight nylon mesh and synthetic leather to reinforce high impact and abrasion areas offers great balance and flexibility. Consequently, because of this trainer-like weight and composition, they offer great out of the box performance. As such you won’t need to worry about breaking them in before a weekend adventure. It also means they’ll ably double up as dog walking shoes or park trainers, further adding to their flexibility. Hidden below this hybrid of materials is the renowned Gore-Tex liner. This will ensure your feet stay dry even on the wettest of days. 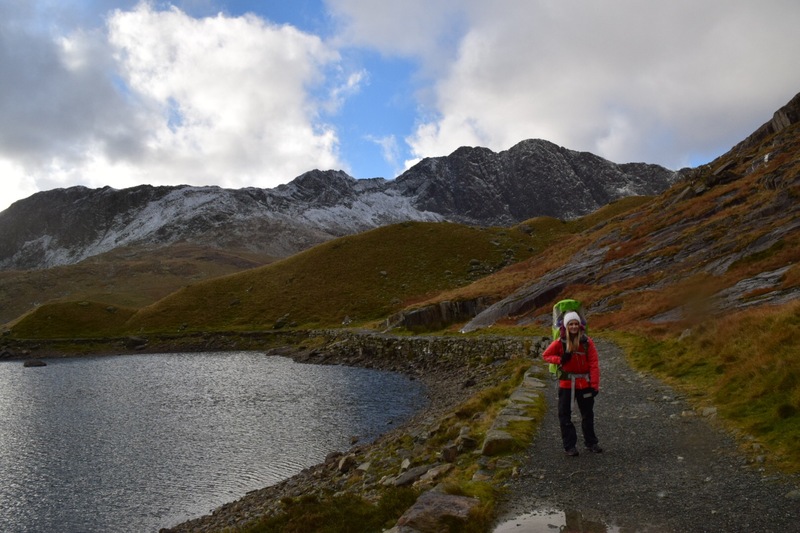 Nat certainly put that to the test on our recent family friendly group hike. With four hours of persistent rain to keep at bay, the Gore-Tex membrane really had to earn its money. In spite of this it managed it…nearly. However, nearly losing your entire lower leg, never mind your foot, to a well hidden bog would have had most wellington boots in trouble, so we can certainly forgive Merrell that one. Bogs aside, the bellow tongue is designed to keep trail debris out of your shoe, keeping annoying stops to a minimum. Inside there’s the tried and tested Orthalite footbed. 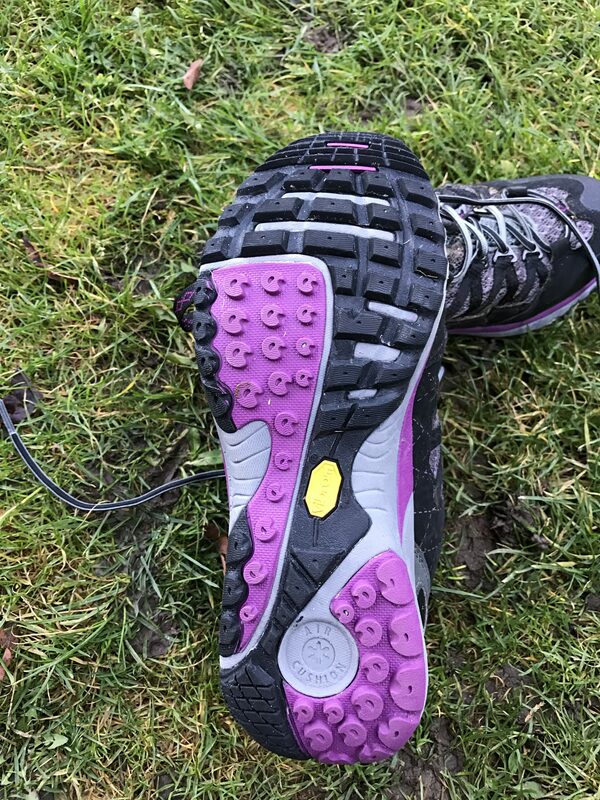 This is easily one of the most comfortable footbeds available (I have one in a pair of my Salomon boots) further helping you to eat up the miles. Moreover, the compressed EVA midsole and air cushion in the heel offer the right amount of support and protection from whatever the trail may throw at you. Outside the proven Vibram sole offers great traction in wet and unstable conditions while the 3.5mm lug will shed all but the gloopiest of mud. In fact, apart from the bog, Nat had no slips or losses of traction whatsoever on our very wet recent hike. 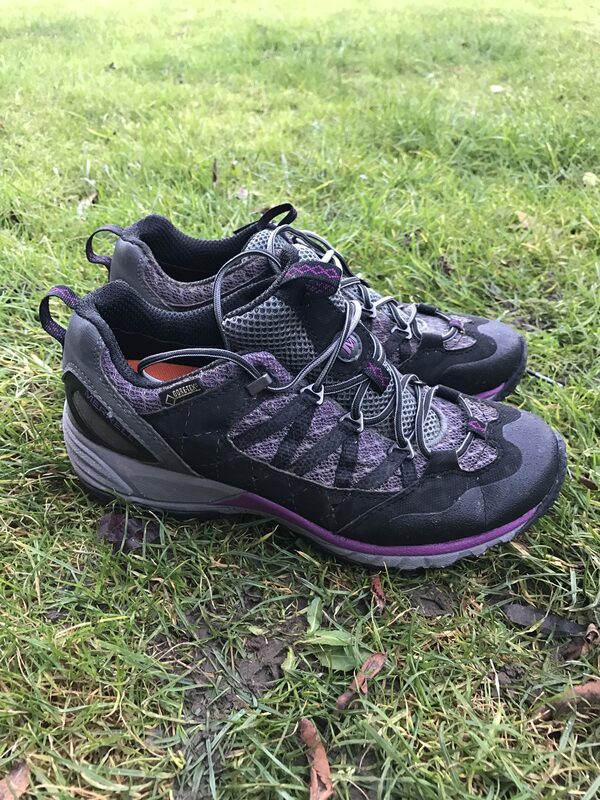 Overall these are a great multi-use hiking shoes for women: comfortable and protective; lightweight and aesthetically pleasing. If you don’t quite have the need for a full or mid boot, but still want to explore the tracks and trails of the great outdoors, then this could be the perfect solution for you. Women’s trail shoes have certainly come a long way in the last few years. No longer overly masculine and clumpy; they look the part and get the job done. These are another fantastic example. And at £48 in the sale, they’re an absolute steal! Those boots look fantastic! Merrell really does come out with the best looking (and performing) hiking boots! They’re a great brand aren’t they! Thanks for the review! They look great, sturdy and yet feminine. Moreover you seem to have found them at a great price. 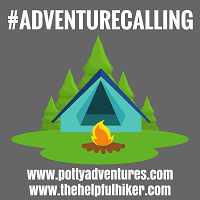 Have fun hiking and enjoying the outdoors, and stay safe! Thanks Mike. And yes they’re we’re a great price weren’t they! Have a great weekend. I really love the look of these and want a pair myself! I did consider getting some before our holiday to Norway but they were a bit out of budget at the time! Hopefully i can grab some before we go to Cornwall we always do so much walking on holiday! Yes these would be great for walks around Cornwall. That sounds like my type of holiday! This spring-like action helps to bear your weight and absorb the shocks that we experience when in motion. Now, when you consider that during an average hike your foot is likely to be put under far more stress than it would during a simple walk along a pavement, then this three-way support could make the difference between feet that need soaking in a footbath for hours on end just to gain their feeling back, and ones that simply want to eat up more trail.